• If you aren't aware of the importance of being eco-friendly and going green, educate yourself and the people around you as that help in better execution. • Biggest impact on our planet is our transportation modes. Choose a greener way of moving yourselves around. Insist on car pooling while driving down to office or choose the public transport. For long distance, prefer trains. Or how about a brisk walk if you stay close by to your office? • Save energy; save planet Earth! Turn off lights and water taps when not in use and keep an eye on water/electricity/fuel consumption. Every drop of water we use also requires energy to filter, purify and transport. Scarcity of water has begun. Use it wisely. • How about keeping a balcony for fresh air than using AC or ceiling fans? • It is not just food, water and fuel that are used more than requirement, but also clothing! Your favorite fabric, cotton is in fact, one of the most heavily sprayed crops on the planet. So remember, clothing you choose also has a huge impact on our ecosystem. • Personal care products and accessories like belts, wallets, handbags etc are also a matter of concern as they use a lot of animal products to get the texture. Remember, less is always more for greener living. • Give up plastic and paper bags while shopping and also toilet papers and tissues. • Say no to bottled water as they are polluting ground water. Choose reusable water bottles and remember to carry your bottles before stepping out of the house. • Stop receiving unwanted catalogues as they require millions of trees and water to be produced. • Give up conventional detergents and choose biodegradable laundry products. 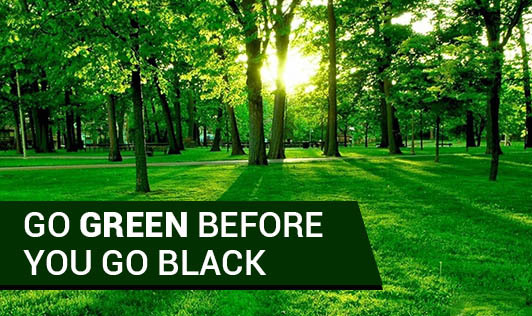 Let us leave behind a greener, healthier and happier earth for the generations to come...go green, save earth!